You Can Reverse Type 2 Diabetes On A Plant-Based Diet. Here Are Studies That Back It Up. Normalisation of both beta cell function and hepatic insulin sensitivity in type 2 diabetes was achieved by dietary energy restriction alone. This was associated with decreased pancreatic and liver triacylglycerol stores. The abnormalities underlying type 2 diabetes are reversible by reducing dietary energy intake. 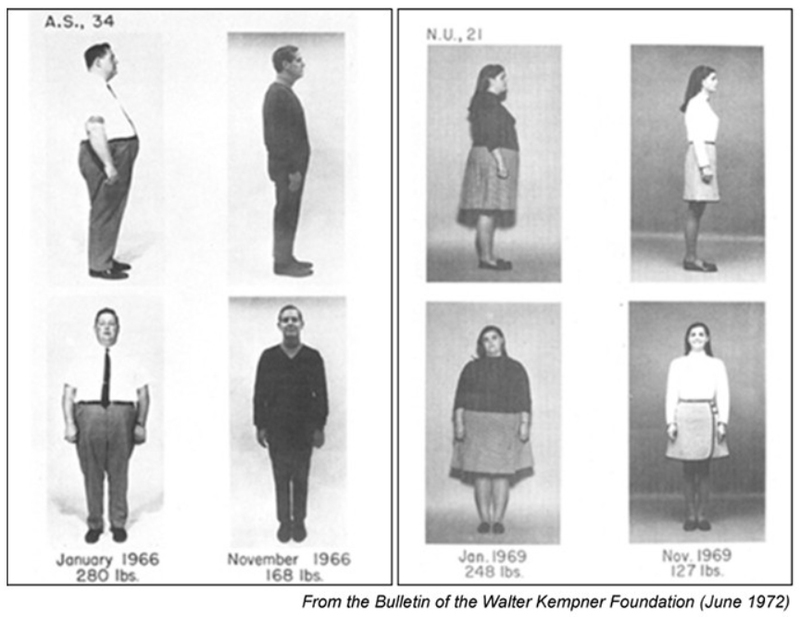 Here are some photos from Dr. Kempner’s rice diet, and some background. It was astonishing at the time. Still is. These studies suggest that [high carbohydrate, high-fiber] diets may be the dietary therapy of choice for certain patients with the maturity-onset type of diabetes. Significant benefits for diabetes prevention and management have been observed with vegetarian and especially vegan diets. This article reviews observational studies and intervention trials on such diets, and discusses their efficacy, nutritional adequacy, acceptability, and sustainability. Research to date has demonstrated that a low-fat, plant-based nutritional approach improves control of weight, glycemia, and cardiovascular risk. These studies have also shown that carefully planned vegan diets can be more nutritious than diets based on more conventional diet guidelines, with an acceptability that is comparable with that of other therapeutic regimens. Current intervention guidelines from professional organizations offer support for this approach. Vegetarian and vegan diets present potential advantages in managing type 2 diabetes that merit the attention of individuals with diabetes and their caregivers. To be clear, we’re talking about diabetics who had had diabetes as long as 20 years, injecting 20 units of insulin a day, getting off insulin altogether in as few as 13 days, thanks to less than two weeks on a plant-based diet. Patient 15, for example, had injected 32 units of insulin while on the control diet, and then, 18 days later, none. Lower blood sugars on 32 units less insulin. A diagnosis of type 2 diabetes is not a forever proposition. One thing Dr. Greger doesn’t mention though is that the diet he prescribes, one of mostly whole plant foods, is accessible primarily to upper classes, not so much to the elderly, the poor and low-income, the sick and disabled. Unfortunately, those groups suffer the highest prevalence burden for diabetes. It’s not that a head of broccoli or a bag of beans will put someone out, it’s the external costs to eating this way which I’ve spoken about fairly often on my blog. Moderate changes in diet can leave one with moderate blindness, moderate kidney failure, moderate amputations. Moderation in all things is not necessarily a good thing. This entry was posted in Uncategorized on September 21, 2018 by Bix.